This new Spanish inspired 15,000 sq. ft. single family home with finished basement and 3-car garage. This open floor plan design includes a home office wing and formal spaces as well as family areas. Each of the three girls has the same size bedroom with their own bathrooms. The master bedroom suite includes an impressive walk-in closet with ample storage and built-in island for hampers and folded storage and accessories. The exterior includes two terraces in the back overlooking the property with plenty of room for this family to entertain. This new 2.5 story 8,500 sq. ft. home located on the shores of Lake Michigan was designed to have the appearance of an East Hamptons estate that evolved over decades. The design was carefully crafted to provide lake views from all living spaces and flood the house with daylight. This new contemporary 4,000 sq. ft. with finished basement single-family home has large expanses of glass and crisp clean lines. This new 3,500 sq. ft. two-story lakefront home currently under construction with an attached garage was designed with simple lines, natural colors and materials with texture to compliment the surroundings. The open floor plan with two-story great room offers spectacular lake views. The bridge connects the guest suites and is a focal point in the space. Lavish new 22,000 sq. ft. two-story contemporary French Country style single family house with walk out lower level and detached pool house on the shores of Lake Michigan. Welcomed by a grand two-story foyer with features that include lake views from all living spaces as well as master bedrooms on two levels, home theater, exercise room and lower level bar. Outdoor features include an infinity pool and spa, multiple terrace and roof decks. This new custom 8,000 sq. ft. barn was designed to display our client’s vintage car collection and entertain their family and friends. The exposed timber structure and rustic detailing play off the architecture of the 1906 main house and the typology of the agricultural surroundings. The amenities and craftsmanship within allows our clients to utilize the space for any occasion. In addition to ample car display area, the barn includes: a custom built walnut bar from site harvested trees; glass walled wine room; custom kitchen with separate catering entrance; an elevated entertainment stage and loft lounge overlooking the car collection. This new two-story 6,000 sq. ft. home currently under construction will offer expansive views of lake Coeur d’ Alene. A series of digital renderings were created to assist the owner during the design phases to depict what the house will look like when completed. The home will have multiple terraces and screened porches to take advantage of the scenic mountainside setting. Inspired by the stately aesthetic of French Provincial architecture this new 10,500 sq. ft. residence is perched on the bluffs of Lake Michigan’s shoreline in Kenilworth. This Craftsman style home wraps around an outdoor courtyard, allowing natural light to spill deep into the interior living spaces throughout. The home was featured in CS Interiors Magazine 2012 Winter Issue in an article titled ‘Let There Be Light’. This new two-story 1,600 sq. ft. single family residence was designed to serve as pool/guest house on an adjacent lot to the homeowners primary residence on Lake Michigan. The open first floor plan includes a glass wall that opens to the terrace and pool beyond. Guest bedrooms are located on the second floor. 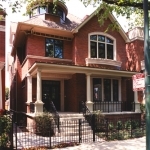 This city home has a traditional exterior design utilizing brick, limestone, and French doors with transoms on the first floor. The interior of this 5,000 sq. ft. home is intended to provide a tailored aesthetic that is classical in its organization and use of symmetry. Incorporating refined stone and masonry details, this Chicago neighborhood home greets guests with its expansive front porch, providing a comfortable and sheltered respite from the bustling urban surroundings.